Powered by Mom Blog has joined the Petco Flash Giveaway! Are you a pet owner and just love your pets? Enter for your chance at a $25 Petco Gift Card! Giveaway is open to US only, ages 18+ and starts at 8p est 8/26 and ends 1159p est 8/29. This Happy Pet Giveaway is sponsored by CouponCabin and hosted by Mom Does Reviews! Love to make your wallet happy too? You can find Petco coupons at CouponCabin. Whether you have a dog, a cat, a ferret or a turtle, you’ll find everything your pet needs at PETCO. The site offers an incredible selection of food, apparel, training aids, treats, feeding accessories and much more. Make sure to check out the videos and articles to help you train your pet and make sure you’re buying the right products. Looking to adopt a pet? PETCO has an easy-to-use tip sheet to help you become the best parent you can possibly be. It’s important to note that Petco offers everyday free shipping on orders over $49.00. More information available at Petco.com. CouponCabin.com works directly with Petco and more than 3,700 other retailers to offer incredible savings on quality goods. Our Petco online coupons save shoppers $31.99 on average. Users can grab a code quickly (less than 90 seconds on average), or sign up for CouponCabin Rewards to earn points toward gift cards. Be sure to sign up at the CouponCabin Concierge to get email alerts when they add new Petco Coupons. Sign up in the right side toolbar HERE. Did you know CouponCabin has an app for that? The CouponCabin Mobile app is available at the GooglePlay and iTunes stores. In addition to the mobile app, they just launched the CouponCabin iPad app! It really is a single coupon app that does it all! Learn more about having the power of saving at your finger tips at http://www.couponcabin.com/mobile/ . About CouponCabin: CouponCabin has been featured in The New York Times, The Wall Street Journal, O, The Oprah Magazine, USA Today, Good Morning America, MSN Money, Good Housekeeping and Yahoo! Finance, among many others. 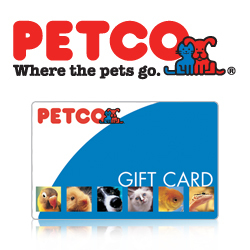 One lucky winner will receive a $25 Gift Card to Petco, thanks to CouponCabin. Special thanks to the following blogs for joining me in this Happy Pet Giveaway: Powered by Mom, Freebie Corner, Bloggity Blog, Africa’s Blog, Emptynester Reviews, Mommy and Baby Reviews and Mom Blog Society. Giveaway is open to US only, ages 18+. Enter on the easy rafflecopter below. Giveaway starts at 8p est 8/26 and ends 1159p est 8/29. “I received no compensation for this post and the opinion stated here is that of my own. I was not influenced in any way. By entering this promotion, each participant agrees to release, indemnify and hold harmless the Sponsor and its parent companies, affiliates and subsidiaries and their respective representatives, officers, directors, shareholders, agents and employees from and against any injuries, losses, damages, claims, actions or liability of any kind resulting from or arising from participation in this promotion.” Powered by Mom Blog is not responsible for prize delivery. I have one dog named max and he is our baby we love him so much. I have 2 cats & 1 dog — the ornery, prococious kind! We have 3 dogs. The two Jack Russels are named Toby and Brandi. The puppy is a Black Mouth Curr named Chevelle. We have 3 indoor cats, and a stray cat outside that we feed… I guess if you really wanted to be technical, you could say we have a raccoon, too, since he/she eats the stray cat’s food every opportunity it gets. i have 2 kitties and just recently got a puppy!! we have two kitties and a dog! We have three dogs all rescues and a snake that is also a rescue. 1 dog named Nelli, 1 cat named Mittens & 1 tarantula named Rosie. I have one pet. Her name is Prissa and she’s a corgie mix. We have three indoor cats so that means we go through a LOT of food and litter! We have two cats and a rat. 2 cats 1 fat lazy indoor cat and 1 outdoor stray that is experimenting with the idea of becoming a house cat. i have a dog and his name it blue..
We currently have 4 pets! 3 CATS & THREE DOGS . I have 6 dogs, 1 cat, hamsters, hedgehogs, chinchillas and fish. We have one dog and two chickens! 1 dog and 2 cats! 4 guineas of the pig variety! I have one 15 year old terrier mix , Toby, poor ‘ole feller. I have 1 Dog and it’s a Rat Terrier and a very picky Eater . He loves table food but doesn’t get it all the Time . If I win I would get different foods for him to try . We have 6 cats but we are closely affiliated with an animal sanctuary here in Central Texas and they always need something from Petco! I have two rescue dogs… Both chihuahua terrier mixes. I have 3 dogs and a bunch of pond fish. I don’t have one yet, this would be for my mother in law who has a kitty. I have 1 Border Collie. One cat but donate also to a local animal shelter. a husband and a teenage boy….oh pets, im sorry….lol none, the previously stated 2 are more than I can handle! I have two cats and two dogs. It can be a handful at times, especially since my cats hate each other. 2 chihuahuas, 1 pitbull, lots of fish and a hermit crab! I have 2 dogs, 2 cats, a gerbil and a sugarglider..
We have 3….. 2 Dasucands , there 2 years old…And the other one is a mix breed and hes 14 years old & still kickin!!! There all 3 my babies! !